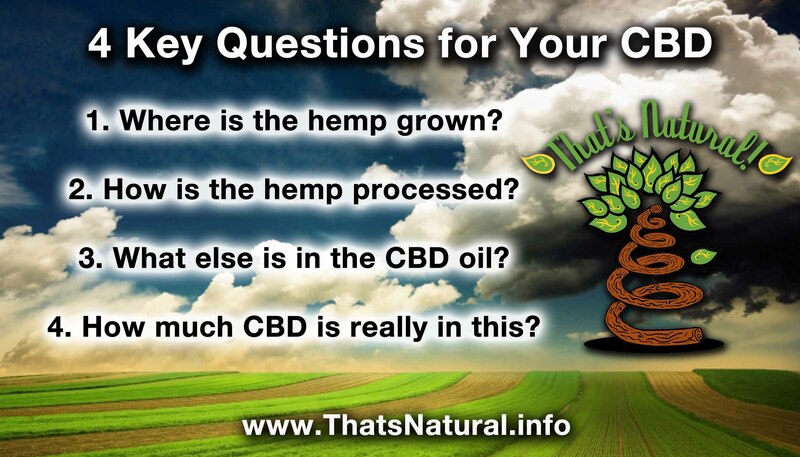 4 Key Questions to Ask About Your CBD – That's Natural! It’s imperative that you know what to ask your supplement-provider. With any product – whether it is your food, your medicine, your body-care products – it is your right to know exactly what you are getting. After all, whatever you put in and on your body, becomes part of YOU. That’s Natural is so excited to be a part of the medicine freedom revolution, and we want you to know some questions to ask when it comes to your CBD, or Cannabidiol supplement. 1. Where is the hemp grown? Why care? Well, since hemp flowers, stalks, and leaves are what are used to extract the CBD, it is important that you know where that hemp is grown. Many supplements use hemp from other countries, mainly from Europe and China and often claiming Organic and GMO Free with no verification, just un-verifiable claims.. Some of these countries may have very different and less stringent agricultural polices and practices than the United States. You have a right to know your farmer – and know who is growing the hemp that is used for your CBD oil supplement. 2. How is the hemp processed? Knowing what process is used to extract the oil from the hemp is also important. Sometimes, producers use harsh solvents (including butane) to extract the oil from cannabis. Although many times they claim that there is no residue, That’s Natural advocates against the use of such a harsh chemical. Another, much more safe food-grade method is using supercritical CO2 extraction, which only uses CO2, which does not leave any harsh or dangerous residue. 3. What else is in the CBD oil? Most all CBD supplements, whether they are oral or topical have some type of “carrier” – whether it is an oil, a cream, a salve, a paste, etc. Just like it is important to check the label when you purchase a food product – knowing the other ingredients are a key part of knowing exactly what is in your CBD oil. 4. How much CBD is really in this? This can get tricky. There are a lot of suspicious claims being made by manufacturers. And almost always, when companies advertise deep discounts on product, or large amounts of percentage of CBD for discounted prices, the customer should definitely do extra research. We have done our own cost calculations for what it costs per mg of CBD as an average, for us. If manufacturers are advertising large percentages by volume of CBD, it would be a good idea to ask for third-party-verification of both “cannabinoid content” and “Cannabidiol (CBD)” content. Just because a label has a percentage on it, does not mean that it is a percentage by volume of CBD – it may be a percentage of something else. Look for the fine print, and ask for verification of what the company is claiming. At That’s Natural! we want you to make informed decisions. We provide the information you need, open transparency! We believe in our product, its quality processing and pure ingredients. We hope you give us a try! Pingback: Absolute Proof from the U.S. Government that CBD and Cannabinoids Are Good for You | That's Natural! Pingback: If CBD Oil Helps Kids, What’s Stopping Us? | That's Natural!